If you’re stuck indoors this winter or bored at work and have already binged through all the classic nature documentaries, we’ve got your outdoor and wildlife fix covered. All across the US, the National Park Service hosts a collection of livestream webcams allowing you to virtually visit your favorite national park in real time. 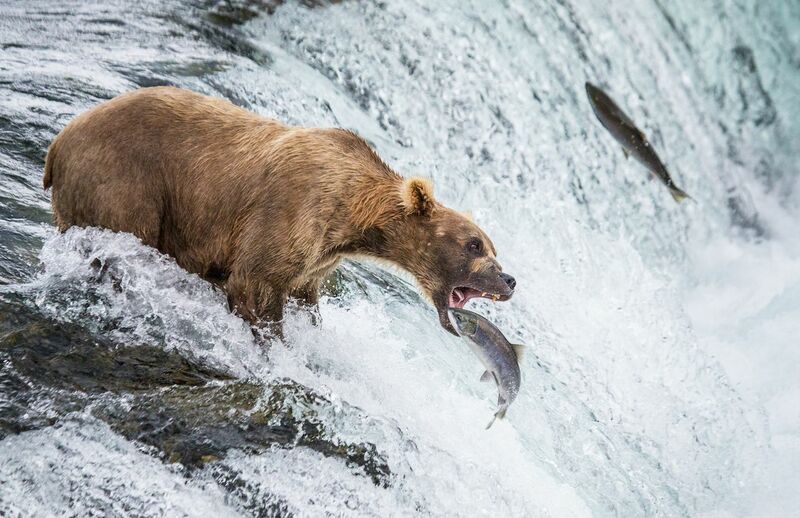 From watching Alaskan brown bears catch salmon to witnessing nesting bald eagles, here are the best national park webcam feeds in the US. Yellowstone National Park contains half of the world’s geysers, approximately 500 or so. Of these geysers, Old Faithful is one of the most famous. The geyser has been a centerpiece of the park since its founding in 1872. 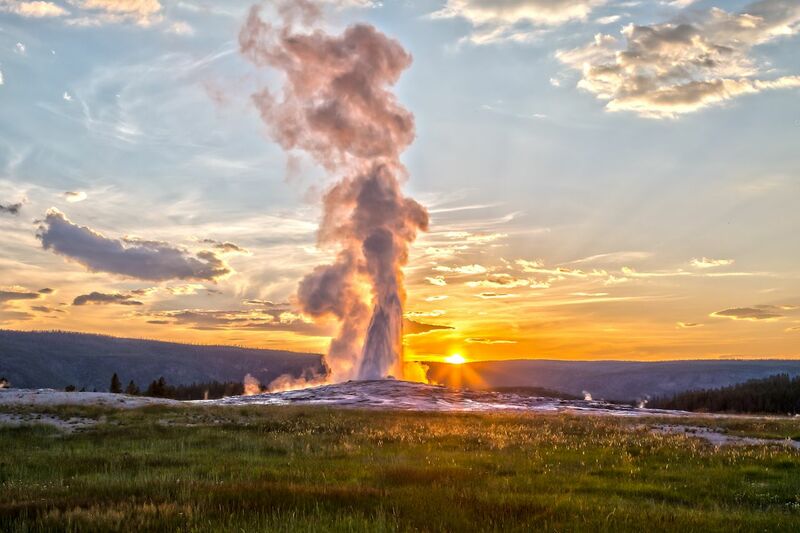 Its daily eruptions can be viewed by people anywhere in the world on Yellowstone’s webcams. The eruptions occur on a predictable schedule about every 90 minutes, and the site has included prediction times and charts to help viewers tune in close to the spectacle. 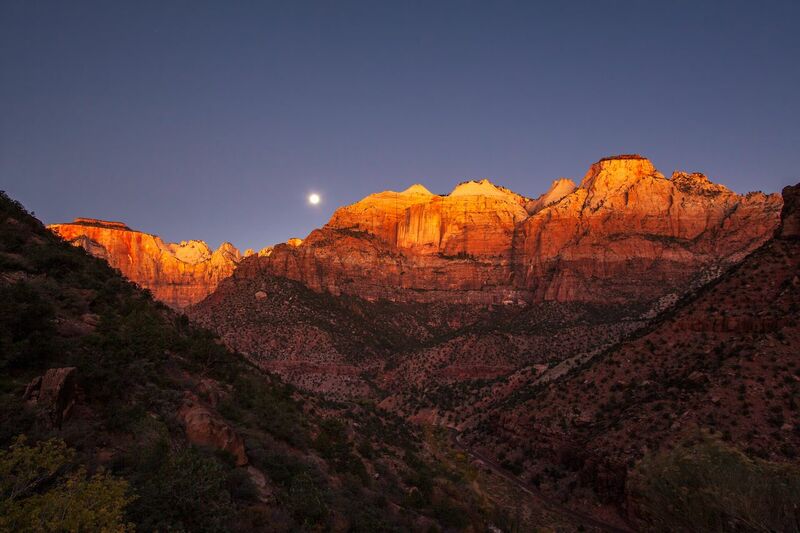 Zion National Park is known for its hiking trails such as Angels Landing, which climbs a steep rock formation overlooking the canyon, and The Subway, which passes through a tubular canyon created over time by water erosion. Another popular destination in Zion National Park is the Temples and Towers of the Virgin rock formation. These cliffs are a popular stop for visitors and photographers, especially during sunsets and sunrises when the light enhances the peak’s colors. The park has installed webcams that face these peaks for those who are unable to visit the park in person. A great time to log on to the webcam is in the early morning hours at sunrise, or at the end of the day for sunset. 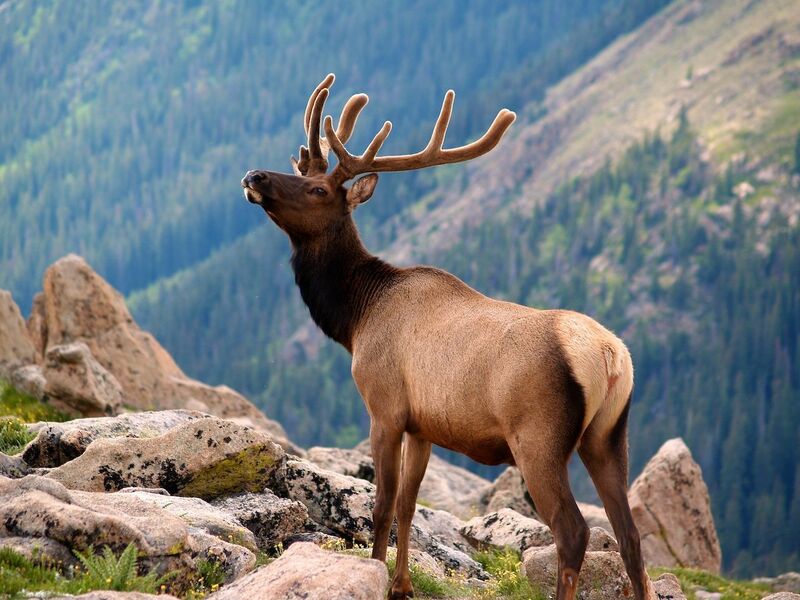 A vibrant wildlife population lives in Rocky Mountain National Park. One of the more abundant residents is the North American elk, a member of the deer family. The webcams stationed in the park provide viewing opportunities to see the elk during every season. From late May into early June, tune in to view the calving season. During September and October, you can watch the elk rut, when the males aggressively compete for mates. Although winter is not as dramatic a season to watch these animals, the elk provide a nice desktop backdrop, foraging for food in the lower valleys of the park. Katmai National Park is one of the best places to safely watch brown bears from the raised walkways in the park which keep visitors and animals safely separated. The Alaskan brown bear is an enormous animal, weighing 800 to 1,200 pounds and standing nine feet tall on its hind legs. Over 2,000 of these animals live in the park, and they congregate near the rivers of coastal Alaska during the summer months. Katmai National Park has webcams at six of the animal’s favorite hangout spots. Viewers can observe the bears hunting, feeding, and foraging in real time. Cubs are also frequent visitors to these locations, accompanying their mothers on fishing trips. The park also uses the webcams to host fat bear week, an annual contest where viewers vote on which bear is putting on the most pre-hibernation fat. 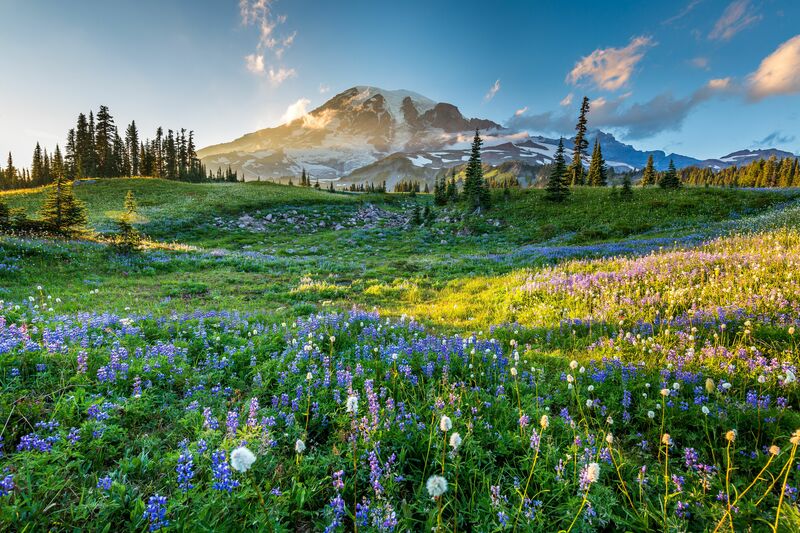 The peak of Mount Rainier National Park stands at 14,411 feet above sea level and is the tallest mountain in Washington state. Webcams at the park are stationed in 11 different locations with views of the Rainier mountain, the Tatoosh range, and believe it or not, the parking lot at the visitor center. Several of the additional webcams, such as the camera at Camp Muir, 10,000 feet up Mount Rainier, are down for the winter season and will reopen in summer. The webcams currently streaming are intended to help visitors gauge the weather, traffic, and parking conditions at the lower elevations in the park. The images are only updated every 15 minutes, so don’t expect to see any realtime animal action on these feeds. 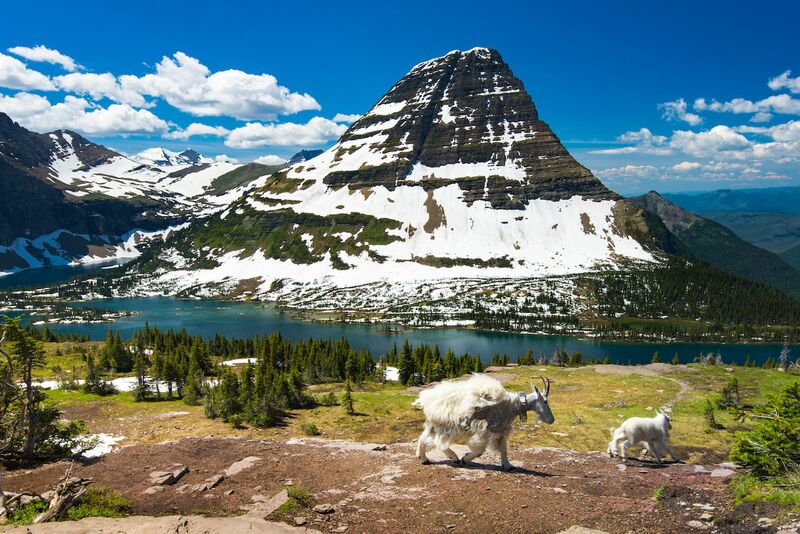 Glacier National Park, located in Montana, is characterized by rugged peaks, a large and varied wildlife population, and grand glacial valleys. There are several webcams in the park highlighting the mountainous terrain, including the Many Glacier webcams, which overlook Swiftcurrent Lake and the peaks beyond. This spring, one of the newer cameras in the park was focused on a black bear den in a cottonwood tree, and viewers were able to watch the family. In the interest of attracting more viewers, the park is currently renovating its cameras, replacing older ones with newer, higher quality models. 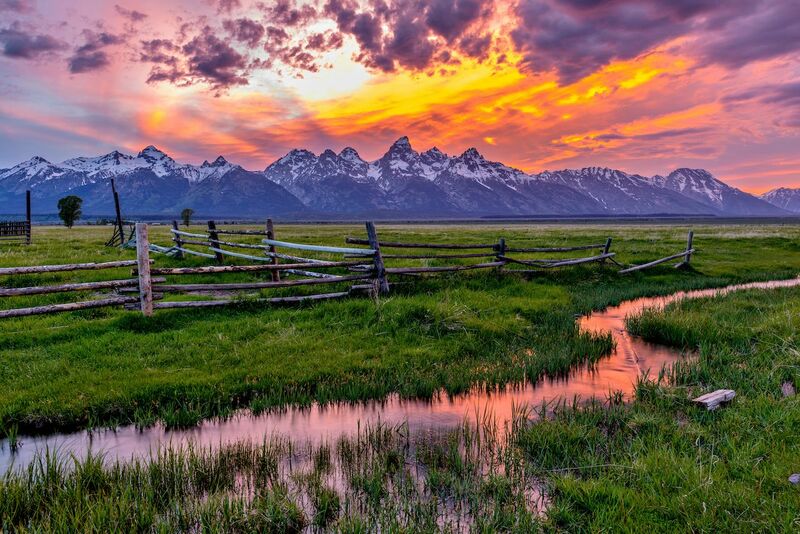 Grand Teton National Park is located near Jackson Hole, Wyoming, not too far from Yellowstone National Park. The Teton mountains, from which the park takes its name, are the star attractions for visitors as well as webcam viewers. The peaks are visited by hikers, climbers, and other outdoor thrill seekers, and the webcams in this area are intended to help visitors plan and prepare for their expeditions. One of the webcams, located at the American Alpine Club’s Climber’s Ranch, assists climbers who need to check the weather conditions on the peaks before they start out onto the mountain. As weather conditions change frequently at high elevations, webcam updates support vital decision-making at the beginning of a climbing expedition. The Jackson Hole ski village also hosts webcams offering views of the ski lifts, ski bases, and mountains. These cameras allow skiers and other snowsport fans check the conditions on the mountain before leaving their cozy ski lodges. 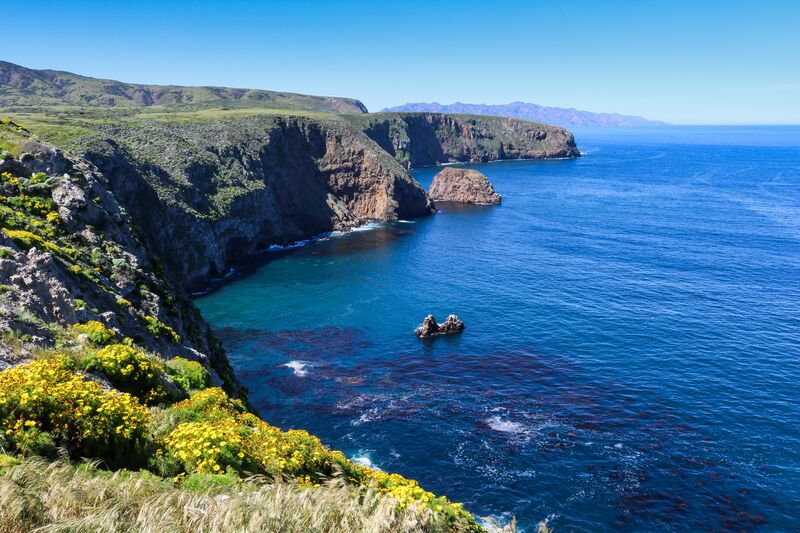 Channel Islands National Park protects five islands and their surrounding waters off the coast of California. The ecosystem supports fish, kelp forests, seabirds, and several species of marine mammals. In addition to these animals, the park is home to a healthy population of bald eagles that hunt and breed there. There are two webcams in the park that provide an intimate look at the nests of breeding eagle pairs during the season. Every spring the mated eagles lay one or two eggs in a nest built on a raised platform. Unlike other birds, they will return to the same nest and add to it every year, increasing its size and strength over their reproductive lifetime. After hatching, the baby eagles will remain in the nest for 10 to 12 weeks while being cared for by both parents. Webcam viewers are able to watch their development from adolescence up to when they leave their nest. Below the surface, Channel Islands National Park also offers a glimpse into the ocean world surrounding the islands using an underwater webcam. This webcam is not stationary and shows a dynamic, changing view of the kelp forest and its inhabitants. Common sightings are of the various fish, sharks, and marine mammals that live here. Sea lions can be especially curious, inspecting the cameras up close. This camera also has sound features, so you can turn the volume up to enjoy the peaceful sounds of the sea.